Switch the crowds for calm this summer and escape to New South Wales' Lake Macquarie, offering visitors unrivalled fun in the sun. Only 90 minutes from Sydney, Lake Macquarie's 32km of pristine coastline is home to some of the country's most spectacular – and secluded – beaches, baths and swimming spots. Lake Macquarie's iconic Caves Beach and its extensive network of sea caves and rock pools are ideal for low-tide exploration. Crawl through tight holes, hang out in shady caves or sun yourself on the Beach's sandy shores. In an idyllic location at the northerly end of a stunning nine-mile coastal stretch, Redhead backs onto magnificent red cliffs and is renowned for its iconic shark tower. The perfect spot to enjoy panoramic views, take a dip, try your hand at fishing or join the local surfers, Redhead Beach's Cargo Espresso Bar is also well worth visiting for an early morning coffee, homemade botanical soda or delicious bite to eat. 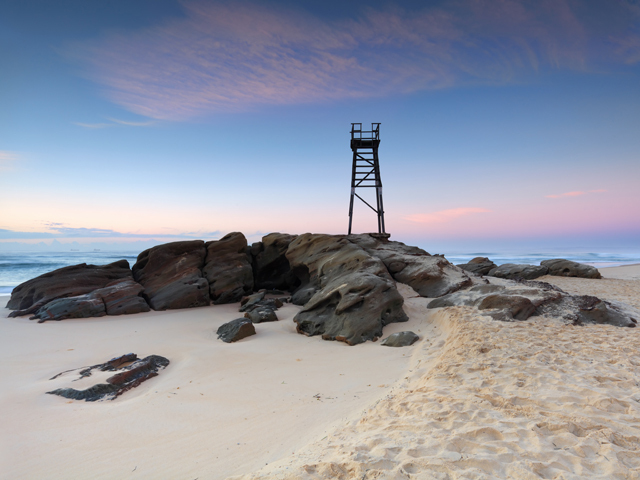 Perched on the picturesque shores of historical mining town Catherine Hill Bay, this is one of Lake Macquarie's premier spots for snorkelling and diving – especially around the local shipwrecks which are teeming with marine life. It's also a popular pick with local board riders for its superb surf breaks. Facilities include barbeques, bathrooms, a small kiosk and the Catherine Hill Bay Surf Life Saving Club - plus the historic Catho Pub is only around the corner! One of the local coastline's top swimming beaches, thanks to protection from the Swansea Channel Breakwall, Blacksmiths is a fabulous family playground, famed for its nearby 'Grannies Pool' - a sheltered inlet loved by local toddlers – and their grannies! Blacksmiths' facilities include bathrooms, picnic tables, barbeques, a local takeaway outlet and the Swansea Belmont Surf Life Saving Club.